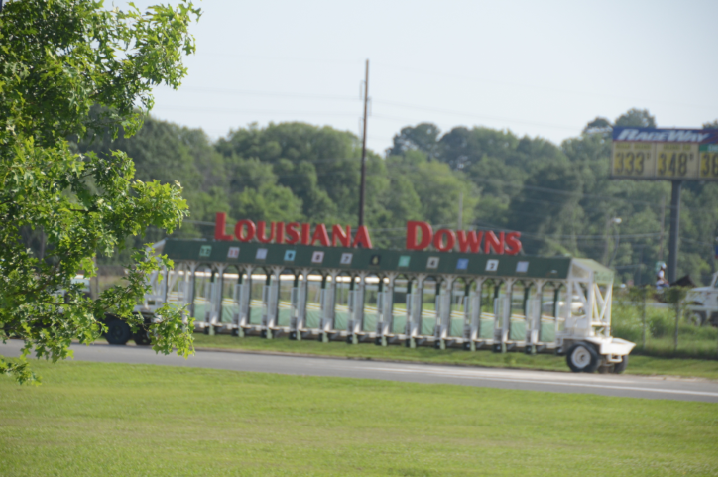 In between my first Alaska cruise in May and the July 1 Alaska sailing that I had talked Tom into going on (switching the Caribbean cruise we had previously booked for the July 4th holiday), he decided he wanted to visit Louisiana Downs. Tom’s a big horse racing fan and we go to Lone Star Park all the time, but he had never been to the track in Shreveport. So, in my role as family travel agent and planner, I g ot online and found us a hotel room that looked good (not having any idea just how good it was going to turn out to be), verified with Kris that he was working in Dallas that week and could house- and pet-sit, and we were off on a road trip – the first one we’d taken since I got the new Cadillac. It was a beautiful Friday afternoon for a drive. It didn’t take long (about 3 hours) to reach the Shreveport/Bossier City area. There was some traffic going through Shreveport, since it was Friday during rush hour, but Waze (the GPS app on my Galaxy Note 3) guided us unfailingly through it and before you know it, we were pulling up to the hotel, which was right across the parking lot from the track. The hotel was the Springhill Suites, and we checked in and made our way to Room 141. When we opened the door, we were in for a surprise. The room, or more accurately the rooms, were huge. It really was a suite, with a big living area that had a nice desk, a small table where you could eat (or a second person could set up a work space, a sofa, and a little kitchenette with mini-fridge and microwave. The separate bedroom was big, too, and so was the bathroom. But for Tom, the best part was what was just outside the window across from the desk: the track was right there. He was in seventh heaven. We got settled and went looking for a restaurant, since it was past our normal dinner time and neither of us had eaten any lunch. We found a Logan’s Roadhouse and had a good meal. I ordered my usual grilled chicken, broccoli and sweet potato, trying to at stick to my diet since the cruise was coming up in a couple of weeks. The next morning, Tom got up before me and when I went into the living area, I found him at the window, watching the horses warm up. He was ecstatic to have a front row seat from our room. A bit before the first post time, we checked out of the hotel, loaded our bags into the car, and headed over to the casino and track. It was nice to be able to just walk over and not have to find a place to park. Soon we found our way to our table (on the glass!) and waited for the the first race. We didn’t win much, but we had a good time. It was a short trip, but it was fun – a nice, brief getaway that didn’t cost much, gave us a chance to “break in” the new car on the highway, and provided an opportunity to spend some quality time together. It was a great “warm up” for what was probably the best trip we’ve ever taken together, which was coming up soon and which I’ll be writing about here, in great detail, next.